Well, hopefully everyone is well underway with their Montgomery books and stories of choice this month. I finished two from my list (helped to have a head cold to slow things down!) and I'll post my thoughts on those next week. So far, I'm having a blast! As is the case with each LMM Reading Challenge, I like to host giveaways each way to celebrate and put titles in your hands that are otherwise difficult to find. Unfortunately, a great many LMM titles are either out of print or being sold at an exorbitant cost that it is making her works less accessible to modern readers. 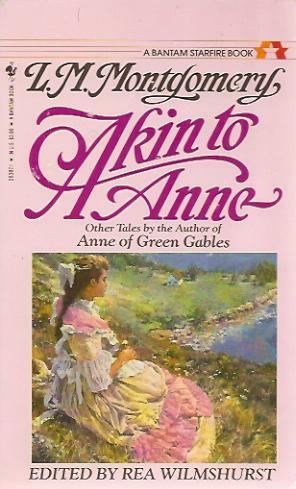 All year long I browse used book stores, garage sale and my local Goodwill to find non-Anne titles to give away during this challenge. If you look hard enough and long enough you can find some though so we have some contests to hold! This year I found TWO copies of Akin to Anne: Tales of Other Orphans which is a collection of some of her short stories. At any rate, I'm delighted to be able to pass along this title to TWO of you. To win? Simply leave a comment below. This contest is open to US and Canadians and will be open through Thursday, January 10th. Be SURE to leave a valid e-mail address in your comment! An extra entry is available for any individual who is participating in this challenge and wrote up a post saying so! THIS CONTEST IS NOW CLOSED. THE WINNERS, as selected by random.org, ARE #1 - Amy and #12 - Tarissa! Congrats, ladies! I don't have this one! Thanks for the chance to win, Carrie! Can you believe I passed up 2 volumes from the AofGG series at my library book sale (at 25c each!)? When I went back this week, they were gone. I would love to read from LMM's short story collection. Thanks. I've downloaded lots of (FREE!) L.M. Montgomery short story collections on my Kindle (doesn't that make you want one, now? ), but it's always nice to have a hard copy! I am participating in the challenge, but haven't written my post yet. This will be good motivation to get it done! I haven't seen this one before! Ooh, I would love to read this one! I can't wait to start scouring used bookstores myself. I have this one, so don't enter me in the giveaway. I used to search the bookstore as a teenager to see if any short story collections were there and I think I have all that were printed. I do need to reread my L.M. Montgomery collection. I can't believe you have a Montgomery Challenge and I missed it somehow! How absolutely wonderful!! I'd love to have a "new" book from LMM, filled with cheery stories I haven't read yet. Thanks! Never heard of this one--thanks for doing a give-away. I still haven't found this one myself! oh, thanks for the chance to win . I love these gems you find for us. Thank you for sharing Anne with your readers! I've never seen this one!